Williams was docked a game in the crucial second set of her match against Naomi Osaka for calling the experienced Ramos a "thief" - and she used her subsequent post-match press conference to call her penalty "sexist". But Ings, who penalised John McEnroe a game during a match against Boris Becker in 1987, hailed Ramos for his decisions and said he umpired the match "absolutely perfectly". 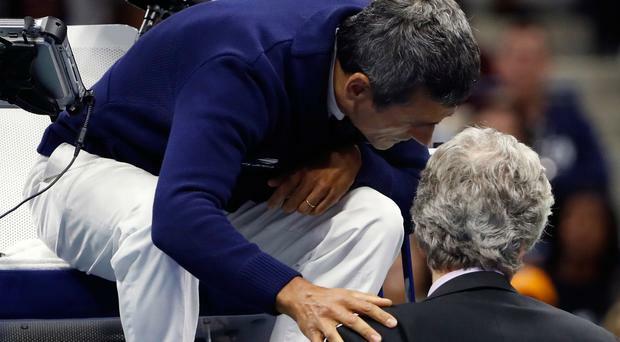 Ings said: "Carlos Ramos is an umpire with 40 years of experience. He handled that match absolutely perfectly. He saw violations and he had the courage of his convictions to call them. "I support him 110%. It was one of the best officiating jobs that I've seen in years." The International Tennis Federation has said nothing other than to state it does not control the Grand Slams. Former British tennis No.1 Annabel Croft said that, while she had sympathy for Williams, her claim that she had been treated differently because she is a woman was wide of the mark. "Carlos Ramos is not sexist," she said. "He's a very strict, very decisive umpire, who takes nothing from any opponent whether they're male or female. "I've seen him giving time violations to Rafael Nadal out there on the court many, many times."